US stocks rose strongly in the second quarter of 2018, as seen by the 3.4% rise in the S&P 500 Index. The broad market index climbed higher on rising earnings expectations and sound economic data. Growth stocks remain the darlings of Wall Street and have been leading the popular indexes higher. Amazon.com is up 45% year-to-date even after rising 56% last year. Netflix, which also rose 55% last year, has rocketed 100% this year. These are huge gains for large companies, but also suggests the average stock may not be performing as well as the benchmarks due to the performance of the mega-cap growth stocks. Growth leadership is common during the latter stages of an economic expansion, but it can also persist for some time. We continue to monitor for an economic shift and/or the effect President Trump’s trade war may have on the economy knowing that its effects could be significant. During the quarter, the Federal Reserve raised the Fed funds rate another 25 basis points. The interest rate for excess reserves at the Fed, a leading indicator of short-term rates, has now reached 2%, up 75 basis points this year and 175 since 2015. Market participants have long feared Fed-driven interest rate tightening cycles for a variety of reasons: tightening has historically marked the end of economic expansions, indicated economic overheating, spurred inflation or led to policy errors. Thus the mantra, “Don’t Fight the Fed”. However, since rates remain low and this tightening cycle is largely driven by the need to rearm the Fed’s tool kit, a better market mantra might be “Don’t Fight The FRED”. The FRED is the Federal Reserve Economic Data Series published by the Federal Reserve Bank of St. Louis. Rather than fretting about rising rates, investors should remember the stock market focuses on forward-looking data and the future health of the economy. We are not saying there are not legitimate concerns that the market shouldn’t heed (more on that later), but this time around, fear of rising rates should not outweigh the economy’s fundamentals. The first accompanying chart is the FRED Civilian Unemployment Rate for the last 10 years. 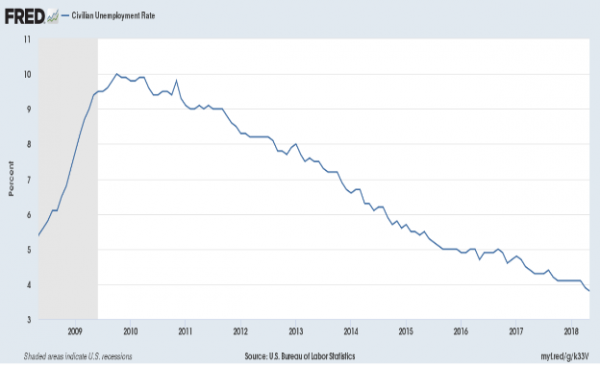 The peak in unemployment caused by the subprime crisis has clearly been reversed and has steadily improved since 2009. It now stands at a 17-year low of 4.1%. 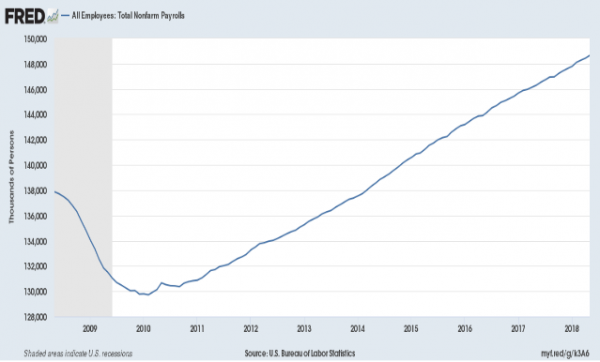 Job openings are also rising, suggesting that despite the tight labor market, companies still want more workers. In addition to the healthy job market, housing starts also continue to climb. New homes are required to meet housing shortages, which fuels construction jobs a demand for materials. When taken together, these paint a rosy picture for the consumer. Construction activity and home prices are climbing, jobs are plentiful, and the net worth of the average household is rising. Corporations also continue to buy back shares and raise dividends, further boosting the wealth effect. Returning excess capital to shareholders has added incremental support to equity prices thanks to the January tax cut bill. So while rising interest rates aren’t investors’ preferred environment, the economic landscape is still supportive. 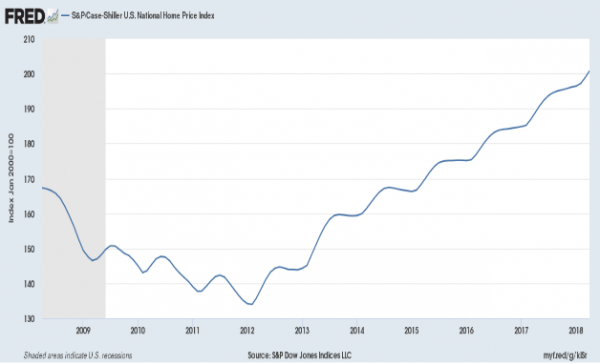 As rates were arguably strategically suppressed in order to repair the damaged housing market and a result of the sub-prime crisis, normalizing rates shouldn’t be too scary. Two percent is still historically a very low level. On the horizon, stocks may at some point begin further discounting the effects of President Trump’s trade war with China. Semiconductor stocks, a group that is the most exposed to manufacturing supply chain in China, have underperformed the market as anti-trade rhetoric has built. The Philadelphia Semiconductor Index (SOX) is down over 11% from its March all-time high. Alienating our largest trading partner and the holder of US debt is obviously a dangerous strategy. And while the administration’s grievances are legitimate, correcting the imbalances may require some economic pain. Only time will tell, and it remains an important issue that we will monitor closely. The Philadelphia Semiconductor Index (SOX) is a Philadelphia Stock Exchange capitalization-weighted index composed of companies primarily involved in the design, distribution, infrastucture, and sale of semiconductors.